Easter week is one of the most interesting, colourful and exciting times in the Greek Orthodox calendar. In our village everyone participates and preparations for the big weekend begin well in advance. From the decorating of the eggs to the baking of the flaounes - traditional cheese pies with herbs and raisins. This year we have a great schedule planned so visitors and locals alike can experience an amazing traditional Easter. One of the most beautiful sights is Friday at the Agia Marina church. In the morning women begin decorating the epitaph with white carnation flowers. During the evening service it’s paraded around the streets of Kalopanayiotis followed by church goers holding candles battling to keep the flames alight in the breeze. On Saturday, the smell of the flaounes wafting through the spring air may just force you out of bed. Meet our chefs who will be holding an open air baking workshop in the Casale traditional village oven and you can learn how to make them yourself, just like our grandmothers used to. Don’t forget to dye your eggs. 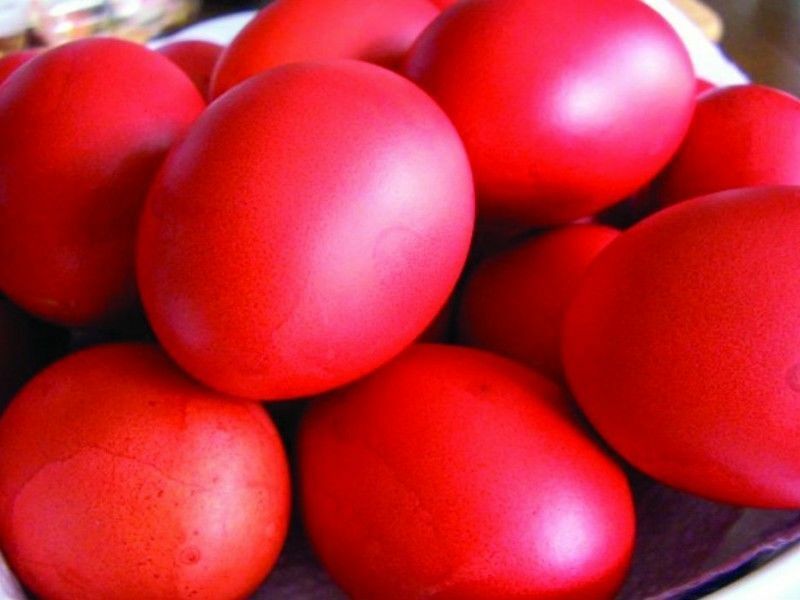 No Greek Easter table is ready without a basket of red eggs in the middle waiting to be cracked. Join us as we paint ours with natural local herbal and plant dyes. To play the egg cracking game, each player holds a red egg, and one taps the end of her or his egg against the end of the other player's. When one egg's end is cracked, the person with the uncracked egg uses the same end of the egg to try to crack the other end of the opponent's egg. The player who successfully cracks both ends of their opponent's egg is declared the winner and, it is said, will have good luck during the year. Saturday night church mass is the most magical of services, held this year in St.John Lambadistis monastery. People hold special white candles which are lit just before midnight as the Eternal Flame on the altar is passed around the congregation. And the whole church fills up with light. At 12am, the bells ring out to announce the resurrection of Christ and everyone sings. By then, you should have worked up an appetite. Especially, if like many in the village you’ve been fasting. We’re serving traditional lamb “mayiritsa” soup in the Byzantino restaurant after church. Don’t eat too much though, as the next day we’ll have prepared an Easter buffet feast you won’t want to miss, including, lamb and chicken souvla, poached salmon and roasted aubegines with feta. And not to be forgotten, there’ll be Easter egg hunts for the children too.